ShutterstockSandals with socks always looks strange. Many of the men’s style tips we talk about are relatively minor things that can add up to something greater: tie length, suit fit, or wearing moisturizer for example. There are few things in the art we call style that are unequivocal. All of the rules we foster and advocate can be broken once you know what you’re doing and can get away with it. Wearing socks with sandals is not one of those things. It’s such an obvious error, that even women in the r/AskWomen subreddit have voted it the worst thing a man can wear on their feet. Redditors on this subreddit can use gender symbols to signify that they are either a man or woman. For footwear, the worst-voted item was loud and clear with 118 points was this dreaded combo. 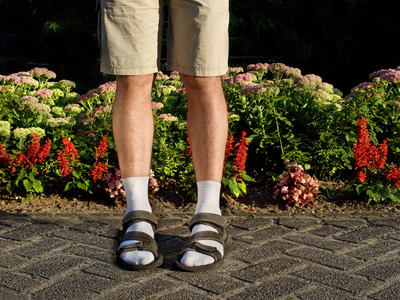 Many men choose to wear sandals with socks because they view wearing sandals on their own as unsanitary — and guess what, they are unsanitary! Sandals usually expose your feet, which is an issue for men since they rarely take care of their feet properly to be showing them off in public. Socks with sandals remedy this problem in a terrible way that no one really asked for There is no circumstance in which it is acceptable. Instead, take advantage of the numerous different options that are available to men in summer footwear options including sneakers, loafers, boat shoes, casual dress shoes, espadrilles, and more.